This month's spending is the result of frittering. I think I had a mild case of the Winter blues, & the only cure was more cowbell shoes. No, I did not get "the bag"... but more on that in another post. Seriously every shoe company that has my email address tempted me & tempted me with sales until I gave up & admitted that every single pair was cute, but bringing home more than 4 in one month would surely be a sign that I had a shoe problem. It is my dream to own a pair of classic pumps in every color. Ty says my dream is silly, but seriously what do boys know!? Dreams are dreams people! So what did my budget get me this month? I picked up 2 pairs of shoes from the ShoeMint Sale & have already worn the Leopard pair worn here. I also scooped up 2 pairs of shoes from the ShoeDazzle Sale. Adding red (worn here) & silver (worn here) heels to my dream rainbow pumps collection. And how much did I spend? Sooo, not great, no wardrobe staple holes filled - although I am pretty much obsessed with the new peplum top, you will be seeing much more of her in outfits to come! How did your shopping conquests go this month? Did you stay on budget? Get any super scores? I am linking up with Franish for her "Budgeting Blogger" series, check it out, & enter too... if you dare! I just bought a black peplum top too so I'm looking forward to seeing how you style it! I'm loving all the shoes...the yellow ones are SO fun! You got some great things! I kind of want to do the same thing now, great budgeting idea! 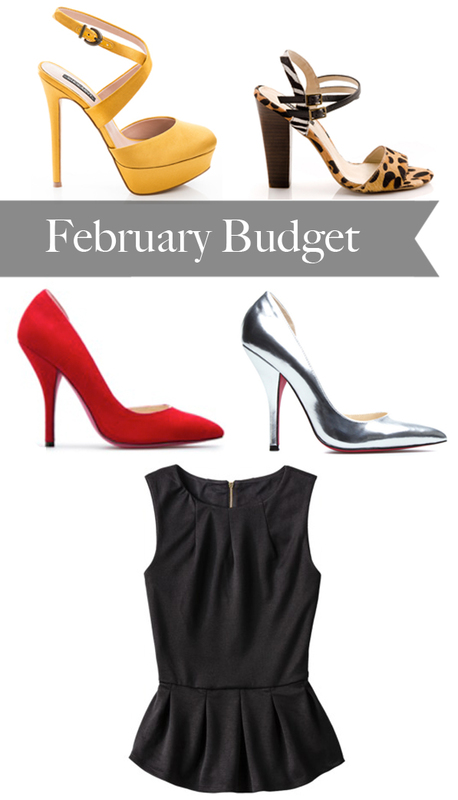 I need new shoes so badly- that's what I'm going to try to focus my budget on for spring! Well I must say that while I don't want to be another form of temptation during your no-shopping month, this peplum top is my favorite that I have seen/tried on so far. It looks and feels of a much higher quality than its price tag suggests! Jessica- drooling over all the shoes, I think my favorite are those red pumps! I don't think heels in every color is silly, I mean, great heels that can last the rest of your life?! You're gonna need every color at some point! I think that peplum top is classic too. My shopping philosophy lately has been do as little as possible, because I don't have much space/money. BUT a graduation/real life job/new apartment is in my near future, and then all bets are off! I am obsessed with ALL of your shoes! And it's not a silly dream... DO IT DO IT DO IT! Can you tell I am just as shoe obsessed as you?! :) And that peplum top is adorable :) It's okay, I didn't really fill in any holes in my closet this month either. I did get some more winter outerwear, which is good! love this! you have the best taste..
Love this year budget idea , shoes lasts for a while though so its always a good investment . I linked up with Franish too...I ended up being $30 under budget! But I stayed away from the mall ALL month, which I don't think will happen in March! Yeah, I bought it. I am going to restart my no shopping month today. I couldn't resist that top (plus a couple other things I found). Target it so great. I bought a ton of shoes in February also, but on great brands, at seriously killer prices! Thank goodness for the Macy's downtown clearance rack, it was pretty epic this month. And I even came under budget, too! Great buys, those yellow pumps are awesome. I don't make it to the mall nearly enough to catch the good sales - I should start giving that more of an effort, we have great stores right here in town. Online shopping is my crutch! hahaha isn't that the truth! Polarized glasses are actually regarded as being the most beneficial regarding out-of-doors efforts with regard to they may have to be able to give exceptional comfort out of sunlight plus the dust and debris.